April got away from me. It was the first month since starting this blog that I failed to post anything at all. The dark-side is that social media (for educators) didn’t turn out to be the kind of ‘succeed’ culture expected, but a feed culture, where people either churn out the same old gruel or stare into their smart phone expecting for the unexpected to be fed to them. I don't need someone pointing me to someone else's stuff and telling me that this is a must-read or an essential. If I have good enough search skills, I can mine the web for my own nuggets of inspiration and my peculiar flights of fancy. But I do wish that I could recharge my enthusiasm for writing here. After all, this is my space - and thankfully, Edublogs has evolved into a comfortable low cost option for people like myself who don't want to do their own domain / own hosting scenario. More budget ranging than free ranging, however. Tumblr interests me but what captures my attention isn't niche enough or focussed to make it worthwhile. Most Tumblrs I see are basic digital scrapbooking - which means the unique ones stand out even more. But it seems that the neglect of RSS, the great open concept of pushing information around, is really having an impact. Google Reader winds up soon and I still have to work out a decent replacement, but one of the best features it used to have was the ability to create an RSS feed of my favourite posts, which I redirected into a widget on the sidebar of this blog. That disappeared, and so did the ability for anyone to see over my virtual shoulder, noting what I thought was worthy of extending out into the network. Corporate siloes are dominating the digital landscape and people seem to be perfectly willing to accept the limitations and standardisations of those places. Nostalgia hardly seems appropriate for the great Web 2.0 premise of anyone and everyone being an author, a critic or social agitator. But somewhere I'm trying to work out where the joy of playing in this arena has gone for me. Fire up the XBox - maybe I can still squeeze in a game tonight. Posted in Blogging, Future Directions, Personal Reflections, Web 2.0 on May 2, 2013 by Graham. The main thrust of the book is around the fact that as digital technology becomes increasingly embedded into our way of life, it is crucial that we have an understanding of how that technology is programmed, and how its "bias" is designed to push human interaction in a certain pre-determined direction. He doesn't necessarily state that actually having programming skills are essential, but having an advanced understanding of what goes on behind the scenes is essential (in other words, digital literacy is a must). Reading his book is very thought provoking and had me viewing a lot of things through a very critical lense - especially at the recent CEGSA2012 conference. An example of a technology with a certain bias would be an iPad where how it all operates is very deeply hidden from the user - this device is very hard to hack or manipulate in a subversive way because the designers have it in their best interests to have users that use their devices in a certain way. Interestingly, who has complained the loudest about the iOS system being closed, the App Store having restrictive guidelines and the device lacking external storage or accessible batteries? The most highly skilled geeks and computing buffs - the programmers. Schools can feel it in the way that Apple pitches the iPad as a "personal" device - so they have to work hard around the programming bias to utilise it as a "shared" learning device. Facebook is another technology with inbuilt bias. It allows sharing - but only within the confines of its digital walls and same-same profile decor. It wants its captive audience to be in the one place so that the people who really pay the bills, the advertisers, can have full rein. But as Rushkoff points out, the internet itself as a structure has a bias towards sharing and openness, so he believes that in time, technologies that try to constrain or control this will have to adapt or become irrelevant. In fact, he makes a real effort to avoid naming specific technologies because he believes that the advice offered in the book will have an infinitely greater lifespan than many of the at-the-moment dominant technologies ruling the web. Rushkoff spends quite a bit of time pointing out the limits of the digital world, which at time seems unlimited to people like me. Choices are always presented in neat packages predetermined by an algorithm or program. An example that springs to mind is blog themes - you might have a choice of a hundred themes but unless you know how to hack or program some aspects of those themes, you are limited to those themes. It explains why unique and really beautiful websites are nearly always created by people with a programming and design background. Mere users like myself are limited to what we are shown by others with the programming skills. So, a really thought provoking book. Grab yourself a copy - at 150 smallish pages, it is not a big read - but it will force you to grapple with some things about the web and digital technology that you may have considered too much before in the past. And those of us who think we are savvy in the digital realm need to have our preconceptions challenged every now and then. Posted in Digital Convergence, Future Directions, Information Literacy, Internet, Web 2.0 on July 14, 2012 by Graham. I observed in the comments that her Top 25 were all American or Canadian, so in the spirit of you don't know what you don't know, here are 25 Non-North American Tweeters that I enjoy. They are in no particular order and as I pointed out to Lisa, I have a long way to go before my list is well balanced and inclusive of educator perspectives all around the world. I only read Tweets in English and from mainly Westernised countries, as I have said before in the past, everyone's a potential hypocrite and I am no different. Learner, educator, deputy principal, English teacher, university lecturer, photographer, blogger, music-lover, likes openness and honesty. Interested in Japan. Teacher, learner, dad, bleeding heart, music and film addict. I want to share as much as I can with as many people as I can as often as I can. Husband, father, teacher educator, Head of CeL (http://bit.ly/cel-nie), but will never grow up. Primary School Chinese language teacher, ICT Subject Head, ICT Mentor and E-Learning Coordinator, #edsg co-creator, Photography hobbyist from Singapore. I'm a teacher who lives and works in Scotland with an insatiable curiousity for what's coming next. Pedagoo Admin. I spell favourite with a 'u. Writer, Game & Educational developer working in digital-culture, learning in a changing (playable) world with kids. Creator of mutli platform narrative adventures for Chinese language students. Owned by: several cats, 3 rabbits, 2 dogs, and 1 small human. Owns: 1 husband. E-learning, Moodle, expat Yank Australian, WoWhead, childless by choice, jazz lover, Atheist, laughs a bit too loudly, looking for answers. 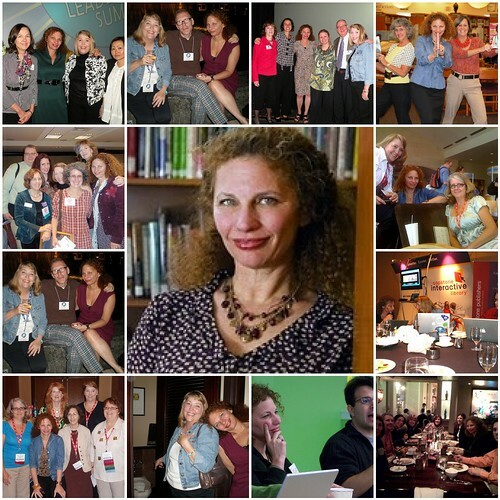 Educator, learner, blogger, librarian, technology girl, author and consultant. Transforming education and libraries. Innovation for life. Deputy Principal & Year 6/7 teacher excited about the opportunities to integrate ICT into learning. Interested in collaborating with others. teacher, writer, reader, cyclist and ed-tech enthusiast. life-long learner, curious and gregarious. Inspiring and engaging learners with (and without) great educational technology. Currently working as a Senior Consultant with Notosh. Actually, if I weren't me, I probably wouldn't bother following myself on Twitter. Posted in Web 2.0 on June 21, 2012 by Graham. 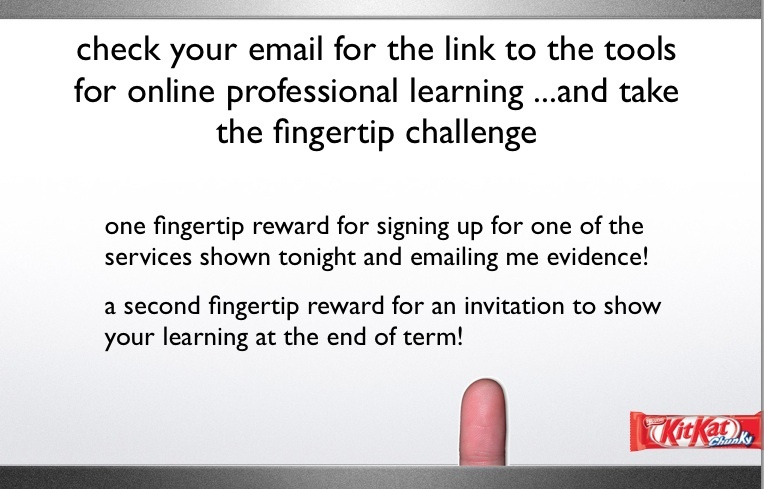 I ran a PD session today as part of our weekly staff session focussing on awareness raising around online tools for professional self-learning. I focussed on the potential of Twitter, Diigo, delicious, Google Reader and touched on Edmodo. It feels weird to be introducing these tools that so many in the edtech field see as standard fare that has been around for quite a while and I know that many on my staff have known about these tools but still many regular classroom teachers are unaware of the potential growth and access to great ideas and resources that social bookmarking and feed aggregation can produce. Bracket, for a moment, the grossness of the scenario. I'll let you decide how the teacher loses the fingertip. The point is that y'all don't understand that you're a bunch of freaks. Someone links up some new online Photoshop knock-off and on muscle memory alone you're entering in your e-mail address and a password and clonking away at your new toy. Real people aren't like that. And you give them too much grief, sometimes, for their unwillingness to sign up for ten different web apps to service ten different nuances in their learning which you have judged to be equally essential. The reward is a chocolate like the KitKat pictured - as KitKats can be broken into fingers (get it!) - and I remarked that I could potentially be up for an expensive purchase of choccy bars as staff signed onto the tools and tweeted or friended me as evidence they were on their way to embracing connected self-learning! A colleague then said that I maybe should have wagered with someone else that I could raise thirty or so new followers on Twitter in a day, and I could have funded the reward! So, Dan, I'm sorry if I keep mentioning you and your work from a year or so back as a starting point for others but you are an ideal role model because you weren't a tech head like the majority of us whose day job involved tech integration into student learning. But if I tell the whole story that you show on your website that shows where you've gone since those days as a beginning mathematics teacher, they may well be overwhelmed and intimidated into not giving this a go. But if someone like me is making a useful contribution, then it can't be that hard. Posted in Staff Training, Web 2.0 on May 29, 2012 by Graham. Tonight's learner PD was using Google Maps to create a story. Here's the link to the story I created as the example and stimulus for my small group of keen learners. I was thinking that this could be a great tool for so many things - great for SOSE, mapping locations from stories, creating narratives, histories, mathematical journeys etc. This has been blogged thoroughly by the talented Silvia Tolisano, and this project could also kick start some great story telling and learning. I could imagine some powerful stories from my school's multicultural student population tracing their family's journey to Adelaide - although many have histories that may not be pleasant to re-visit so sensitivity is always required. An upper primary colleague now wants me to work with her class using Google Maps. I like the look of the Map Maker as well, especially as it comes with plenty of self help documentation. And if I knew how to create the required XML file, then something like Map My Life would be possible. Posted in Internet, Web 2.0 on September 21, 2011 by Graham. I was very lucky to attend today's seminar with Dr Joyce Valenza here in Adelaide, and my head is still swimming from the sheer breadth she covered in the day. The whole day in terms of her presentation, her links and pathways can all be found here on her wikispace created for this down under visit. So I won't try and recreate the day actually that would be impossible because what the site can't convey to you is the sheer passion that Joyce has. It certainly won't demonstrate the furious pace at which our collective brains were filled - I was asked to run the backchannel which was quiet and understated, but participants were too busy listening, watching and checking out links and tools on their laptops to be throwing back too many queries and challenges. By only using the wikispace, you would not also appreciate the urgency in her message - encouraging and enthused - but urgent nonetheless. With an audience of mainly teacher-librarians, I got the feeling that the urgency is as much for the future of this role in schools as it was for the future of our students but of course, the two are connected. So, thank you, Joyce, for a brilliant day. What your brilliant online resource does is enable those of us at today's seminar to go back through your day in smaller bite size chunks at a pace that allows for deeper reflection, fuller exploration and lengthy consideration of how to change and improve the learning for our respective student communities. It'll be something I'll chew for quite a while and is a very timely focus as I start in on my new role. Posted in Conferences & PD, Future Directions, Information Literacy, Web 2.0 on July 27, 2011 by Graham. Via ReadWriteWeb, news of a service called Qwiki that "combines speech-to-text and assembled multi-media to create little slideshows based on Wikipedia entries". Although like Animoto, all of the heavy lifting is done for you, this tool has some potential in the classroom. There's all sorts of talk around the need for primary school students to have "digital literacy" skills and be able to extract meaning from more than just text, and I could see Qwiki as a way of introducing a topic, analysis of a concept, making reading Wikipedia more engaging, assisting kids with reading difficulties and looking at how the actual Qwiki could be improved to effectively communicate about its topic. For example, I did a quick search for Australia Day. When it finishes, it shows a number of related Qwiki shows that can help add context to the original, like the Day Of Mourning or even why Geoffrey Blainey's point of view was quoted. While this tool should not substitute effective research, I think that students would find it a useful starting point for topical research within a number of curriculum areas. Qwiki also has a process for improvement and users can add suggestions for better images, relevant YouTube footage or even the correct pronunciation of key words. (Even Oprah Winfrey managed the correct pronunciation for Melbourne the other night - Mel-bn, not Mel-born.) Student discussion around these points can be a useful part of analysing the role of imagery and audio in conveying information. I'll be trying it out at some stage and I'll post some reflections here when I do. Posted in Internet, Web 2.0 on January 25, 2011 by Graham. Well, my talk at the CEASA Spotlight Seminar the other night seemed to go OK, although I'm not sure that I really addressed the question of how social media can be utilised by professional associations. A quick look at the CEASA website shows that even in this comparatively small state, there are over 50 associations under their umbrella. I belong to one - CEGSA - but I'm a relative newcomer to being a member, only joining a little over five years ago. So, I don't have this ingrained history of having a particular professional stake in the continued prosperity of an association. However, if my short stint on the CEGSA Committee is anything to go by, all associations have similar issues in terms of maintaining membership, maintaining a viable financial base and offering support to its members in their particular field of interest. I use social media as an individual. Associations are about a community. I wasn't really sure where to look to find an association that was leveraging social media for its members until I remembered that Jo McLeay is now working for VITTA. Their approach is to offer an extremely resource rich website and add the social media in on the platforms where they are found out on the wild web. There's a blog and a Twitter account. The Twitter account is interesting in that it's not necessarily a collection of VITTA members on the following list but a carefully curated collection chosen for their potential value to the membership. A quick look at that collection shows a significant number of individuals, all obviously putting out tweets of significant interest for their own network, of which VITTA has now become a node. But as for how many VITTA members are availing themselves of this social media feed, well, I couldn't tell. Professional educator organisations cater for interest groups within the education community. They provide Professional Development sessions, run conferences, maintain websites and newletters with the aim of equipping their members with the latest resources and offering information and opportunities to improve their members' professional practice. This has worked well for quite a long time and many organisations have embraced the use of technology to improve outcomes for their membership base. But in the same way that the internet is a disruptive force starting to rumble through educational institutions, the web and in particular, social media services threaten the status quo. Online events like the K12 Online Conference show that membership to an organisation is no longer a requirement to hold or participate in Professional Learning of the highest quality. The ever popular TED Talks provides keynote quality out of the budget range of any South Australian organisation. Professional associations are a way of pooling talent and resources for the common good of a larger group. But they have to provide value for their annual subscriptions or potential members are less enthused about joining. At the Seminar, two SLASA members showed an online referencing tool that their organisation had developed, pointing out that this had the potential to be a positive drawcard for their organisation and that licensed access to this tool could be an income generator for SLASA. But in my mind, there is a danger in this. My experiences and interactions with many educators online indicate that the days of hording an idea behind a locked web portal and charging for access are over. People will just search for another free tool online. That doesn't mean that talented members should not develop these useful tools. Just don't expect them to be a money spinner. As I wrote before, professional associations are a way of pooling talent and resources for the common good of a larger group. Prior to the internet, this was a way of connecting locally as time and distance prevented the easy exchange of ideas between states and other countries. An annual conference of sister associations across the nation provided important cross-pollinating opportunities as key members travelled to an interstate venue and brought back new ideas and initiatives for the local group. Social media throws the need for most of that out the window. If I'm a Maths teacher, why would I restrict myself to only the ideas within my state association when increasingly, many of the best and most innovative ideas are being published and discussed across digital networks in various corners of the world? Now, it could be that many associations serve a niche demographic where educators of similar ilk world wide are not blogging, tweeting, YouTubing or pooling ideas and practices on a wiki. But there is a definite trend occurring. You could see the edtech community as being an innovator, with early adopters in other educational fields starting to multiply until all areas of the education spectrum have networked individuals sharing and benefitting via the web. So, if professional associations are to stay vibrant, healthy and relevant, they must work out how to leverage the tools social media offer and look at the trends towards openness and sharing in order to redefine themselves for the years ahead. I'm not at all sure what that could look like but like the education system itself, professional associations must continue to evolve to attract membership and then meet that membership's needs in an era where professional learning is ubiquitous as information itself. Posted in Conferences & PD, Future Directions, Web 2.0 on November 13, 2010 by Graham. And if you want to feel the centre of your own self-created universe, hop over to IS Parade and drop your twitter handle in for a visualization that is very different. Posted in Web 2.0 on November 7, 2010 by Graham. Or put more simply, two Excel graphs that show where people who are reading this blog are from and where bloggers I've got in my Google Reader are from, in rough terms. 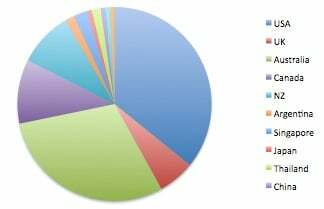 Generated from my Clustr Map stats as of November 2010. Spread of locations of bloggers whom I'm currently subscribed to in my Google Reader. Both should be taken with a substantial grain of salt. The first only measures visitors to my actual blog page - there isn't any way I know of knowing who my subscribers via RSS. The second is everyone in my Reader as it stands right now. It hasn't been cleaned out in ages and there are quite a few people that haven't posted in a long, long while. What does this tell me? Well, I show my monolingual tendencies by sticking to English only blogs. 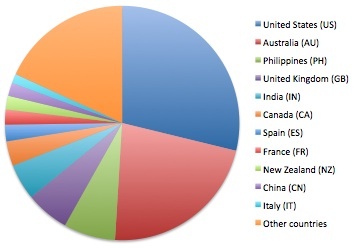 It's not that I don't want to broaden my scope but am unsure of where to look to get away from over populating my Reader with a few dominant countries. Still, I wonder what other people's graphs might look like. Is this a reasonable way to gain a global picture of education and learning? Would my Twitter graph look different? Posted in Blogging, Web 2.0 on November 1, 2010 by Graham.